When the Solent is on form, there is no better place in the world to sail and it delivered in spades for the third day of racing at the 2011 Half Ton Classic Cup supported by South Boats. Three more races were completed, two windward-leewards followed by a round the cans course, bringing the total number of races sailed to seven. The wind ranged from 7-8 knots in the morning up towards 20 during the afternoon and the sun shone all day, more than making up for yesterday's wet and misty conditions. The mix of racing formats went down well with the competitors and once again Rob Lamb and the Royal Corinthian's Race Committee did an excellent job of managing the races, with the team kept busy regularly tweaking the mark positions on the windward/leeward courses. It was a day that required patience and steady nerves with the wind often coming down in streaks. Boats only a matter of yards apart could be sailing in winds of significantly different strength and direction - described ruefully by Chimp's tactician Roger Merino as "the splatter effect". One of the most marked characteristics of this event is how incredibly close the racing is. Yet again today there were multiple cases of boats finishing within seconds of each other. Every mark rounding brought close quarters action and this evening the protest committee were in business again adjudicating on a leeward mark incident during race six, the second race of the day, involving David Evan's Hullabaloo XV, Christopher Haworth's Beat & Run and Robbie Tregear's Per Elise. Hullabaloo XV was found to be in the wrong and was disqualified - a great disappointment as they had finished the race in eighth place. Each race today had a different winner and whilst many of the familiar faces continued to feature it was great to see some new names making it into top ten as well. Race five was won by Philippe Pilate's General Tapioca with Jean-Philippe Cau's Sibelius 29 seconds behind her and Alain Delvaux's Waverider third. Race six went to Waverider by 18 seconds from Chimp with General Tapioca third. In the final round the cans race David Cullen's King One took victory by 52 seconds - the biggest winning margin of the day, Chimp was second and General Tapioca third. For overnight leader Chimp, it was a day of consolidation and pleasant surprises. As they came ashore they knew they had finished fourth in race five but races six and seven were too close to call and they feared they were fifth or worse so were delighted to come ashore and find they had in fact come second in both races. As a result they extend their overall lead of the championship to nine points. Moving back up into second place is General Tapioca with 29 points, 11 adrift of Chimp. Insatiable added eight, ten and six to her score card and holds onto third place, ten points behind General Tapioca. Chani had a mixed day and really struggled in the round the cans race, finishing 24th, so drops down from second to fourth. In the Production Boat Series Chani is leading the fleet with Fredric Denis' Fletcher Lynd second and Mcihael Langhans' Strolch third. Tomorrow three further races are planned. Racing continues until Friday 26 August with up to 12 races scheduled. 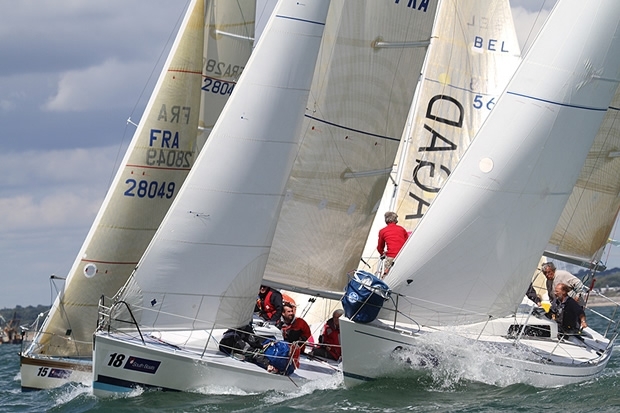 Once eight races have been sailed a second discard will come into play. The forecast for tomorrow is for overcast and possibly rainy conditions with around 15 knots in the morning, dropping to perhaps 7 knots during the afternoon as the skies clear.